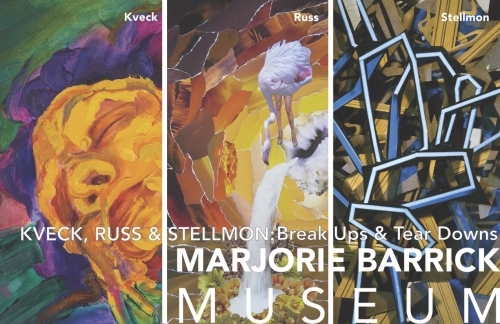 Wendy Kveck, JK Russ and Erin Stellmon will fill the Marjorie Barrick Museum with an exhibition of their art. These three Las Vegas artists offer unique bodies of work that spring from a common practice of breaking down their subject, then reorganizing and reordering the pieces. The results, whether paintings, collages, photographs or constructions, are stunning and thoughtful revisualizations of contemporary themes. Wendy Kveck is a visual artist from the Chicago area who lives and works in Las Vegas, Nevada. Through her work in painting, drawing, collage and performance she examines images of women from art history and contemporary media as cultural signifiers of excess and desire, anxiety and fear, regret and loss. Her recent figurative work incorporates food and drink imagery and references, depicting representations of women as both consumers and consumed. Influenced and inspired by early and contemporary feminist artists, she is impelled by the notion of performance (performing painting, performing our private and public selves) as reflective, reactive and transformative action. JK Russ is an artist from New Zealand who came to the United States in 2010 and settled in Las Vegas. She uses cut-paper collage to create investigative contrasts between the bodies of seductive women and the shapes of landscape and wildlife. Her style is informed by a longstanding interest in Surrealism, photographic illustration, and the photomontage work of the German Dada artist Hannah Höch (1889 - 1978). The Nevada desert is a current source of inspiration, as are Las Vegas’s burlesque clubs. By eschewing digital manipulation and instead insisting on the deliberate imperfections of the analog process, Russ exploits the ambiguous relationship that the medium of collage naturally establishes between realism and fantasy. Erin Stellmon is a multi-disciplinary artist from Oregon who lived in Las Vegas for more than a decade. Her community-focused practice explores local manifestations of transience, memory and reinvention. In mixed-media collage work she frequently emphasizes the visual fragmentation of her compositions in order to highlight the cycles of destruction and reinvention that she perceives are endemic to the Las Vegas municipality’s civic culture.